Global agricultural equipment market faced various changes from past decades to current period. Dependence on machinery for farming has seen a significant raise through time. This industry is on positive lines for growth in future periods. Global agricultural equipment market is expected to grow at CAGR of 2.71% till 2021. Asian markets demand penetration majorly India and China are expected to be highest among all markets. Industry trends towards increasing features of advanced technology developments in machinery. This sector offers huge opportunity for firms to grow in future as there is consistent decrease in agriculture labor and farm mechanization plays major role to meet drastic increase in demand. Major players have witnessed many challenges which have great impact on volumes and revenue. Strategies made on the basis on pain point areas succeeded and provided results on a positive line. Key players have worked on those strategies to overcome unanticipated effects of weather and farmer’s livelihood. The main talking point in the industry is the decrease it had over the past 2 years. This is due to the reason that the farmer’s income decreased due to decrease in the commodity prices. The experts say that the bottom level has been reached and now the industry will flatten out and are showing signs of recovery. The industry is not expected to reach to the high growth levels it reached out around 2012-2014, but it’s expected to show minimal increase every year. Geographically, things would be different, Asia-Pacific would grow at a rapid pace, considering few of its major countries have started their journey of mechanization. South America and Africa is going to show steady growth. Europe is one which is not yet clear, due to the impeding impact of Brexit and region instability. North America will soon be back to the growth ladder, although it won’t be a steep one. 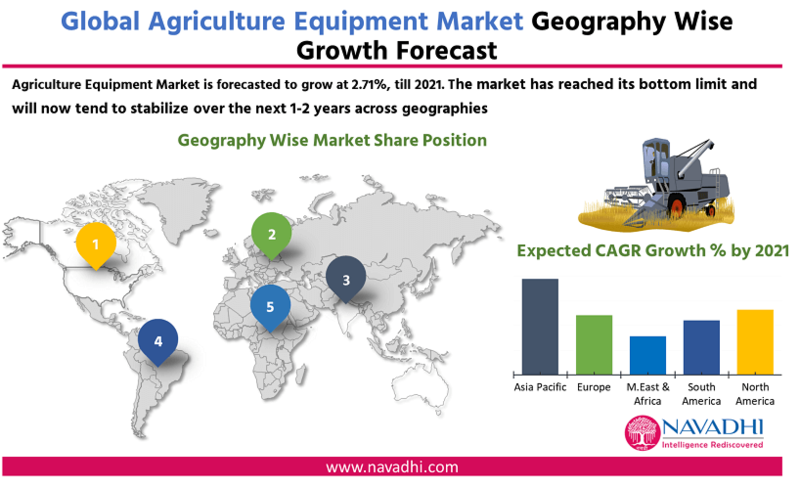 •This report provides a detailed view of Global Agriculture Equipment market scenario. •This report provides detailed information on Global Agriculture Equipment market with growth forecasts up to 2021. •This report also focuses on developing a better understanding of the current state of the Agriculture Equipment Technology. •This study also identifies various policies related Global agriculture equipment market. •The report identifies the growth drivers and inhibitors for the global agriculture equipment market. •This report profiles ten global manufacturers related to Agriculture Equipment market. •This report provides detailed comparison chart of types of equipment available in global agriculture equipment market. 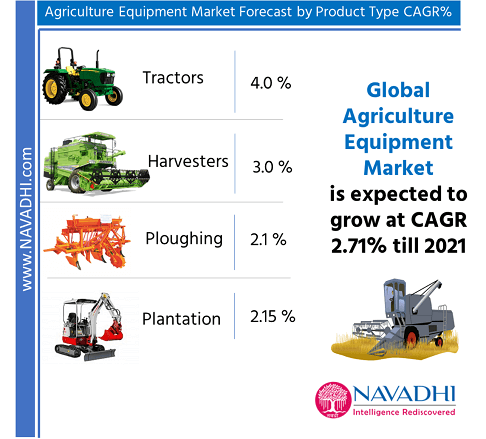 •This report provides detailed competitive landscape of Global Agriculture equipment market. •This report identifies major challenges faced by new players in the Global Agriculture Equipment market. •The report identifies the key risks associated with the Global Agriculture Equipment Market. •This report provides future trends for the global agriculture equipment market. •This report also provides recommendations for policy makers. 7.7.3 Financial Performance of Alamo Group Inc.
7.7.5 SWOT Analysis for Alamo Group Inc.
Exhibit 5.1 Growth Drivers & Inhibitors in Global Agriculture Equipment market.